The stir-fry method puts the quick and easy in this tasty sandwich that features the flavors of the classic salad. Stir-fry 1/2 of beef 1 to 2 minutes or until surface of beef is no longer pink; remove. Repeat with remaining beef. Toss lettuce with 2 tablespoons dressing and 2 tablespoon cheese. 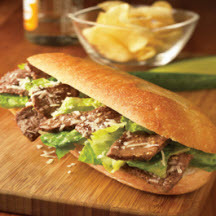 Serve beef in rolls with lettuce and remaining cheese.